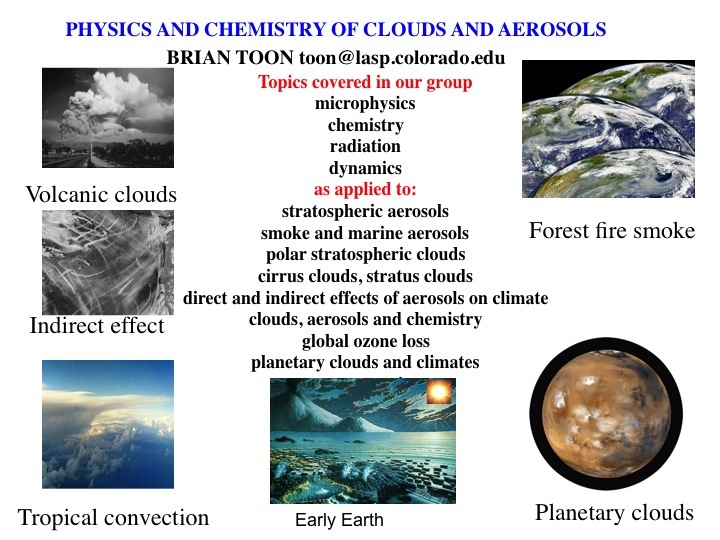 The Toon Aerosol Group is a part of the Laboratory for Atmospheric and Space Physics (LASP) and the Department of Atmospheric and Oceanic Sciences (ATOC) at the University of Colorado at Boulder. The group conducts modeling, laboratory and field studies in aerosol and cloud physics, climate and atmospheric chemistry on Earth and other planetary bodies. We investigate the Earth’s past, present, and future atmosphere, as well as other planetary bodies, including Mars and exoplanets. Brian Toon leads the group. The Toon Group is supported by the National Aeronautics and Space Administration (NASA), and the National Science Foundation (NSF), and frequently collaborates with the NASA Ames Research Center (ARC), the NASA Goddard Space Flight Center (GSFC), and the National Center for Atmospheric Research (NCAR).